Starting from the golden era of boxing to the present, Delgado was and still is sought after by boxing promoters and boxers. 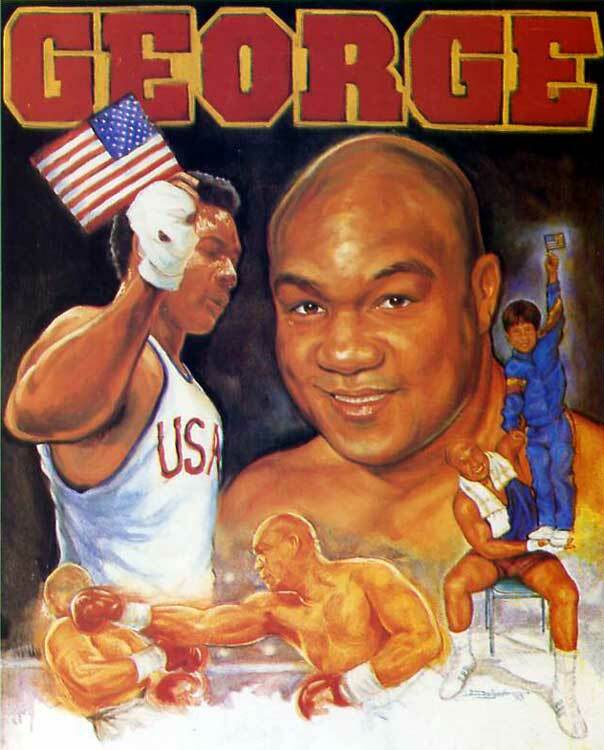 Many of his works were commission by promoters and properties to use for the official posters of outstanding boxing cards. In addition, he has been approached by boxing legends to create their official atistic signature renditon representing their life and boxing career. Some of these have reproduced into limited edition lithographs and /or posters. Below are samples of these boxing works. Each piece is personally AUTOGRAPHED by CHAVEZ! In addition each item is signed and numbered by the artist. 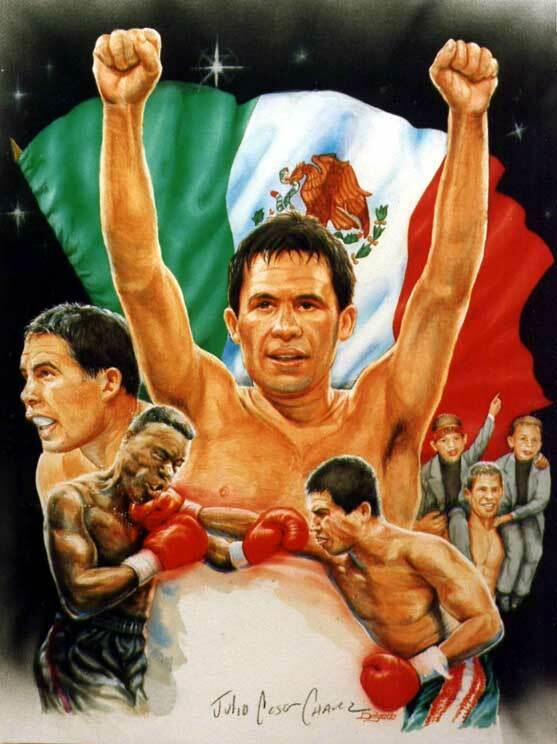 Mexican champion of all time! $59.00 J.C.CHAVEZ LITHOGRAPH Shipping ilncluded. vs. Jorge Paez, a boxing favorite and know for his lavish costumes and antics. 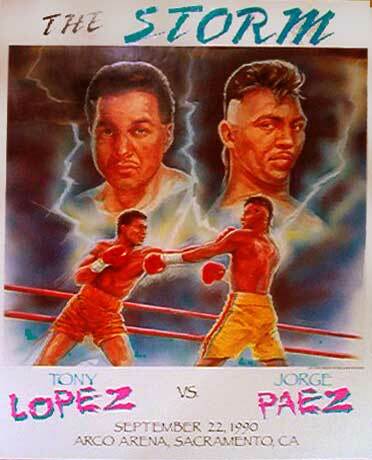 This historical bout ended with a Lopez victory. This was the offical poster of the event. Each poster is personally autographed by the artist! 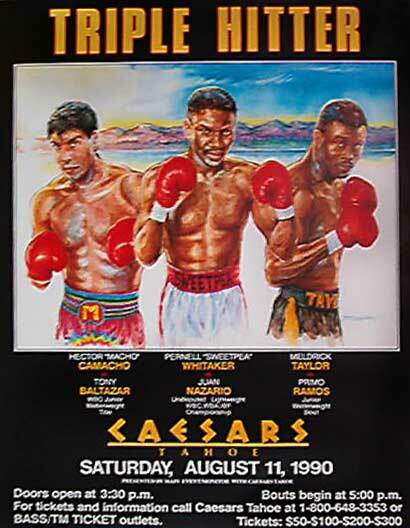 The official poster created by Delgado, features three of of the toughest fighters that ever fought together on one bill. Pernal Whitaker, Hector Camacho,and Meldrick Taylor, all three champions. Each official poster come autographed by the artist. The official poster created by Delgado. The card was held April 3, 1992 in Reno NV. and titled "Tough guys don't dance." 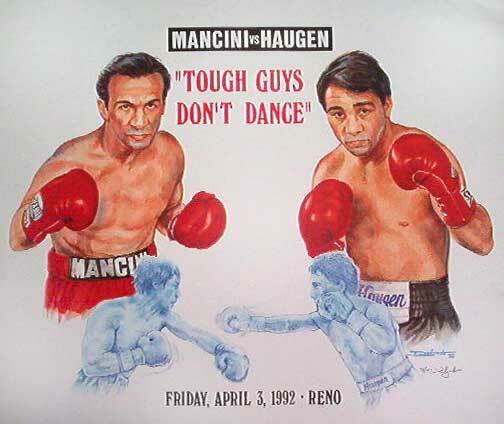 The stage was set for a Mancini's comeback versus a hungry Haugen in Reno back in 1992. Unfortunately for Ray it was his last bout after loosing to Haugen. Each poster is autographed by the artist. EVANDER HOLYFIELD, the three-time world heavyweight boxing champion. This original work was created for the official poster for Caesars Lake Tahoe in 1989. 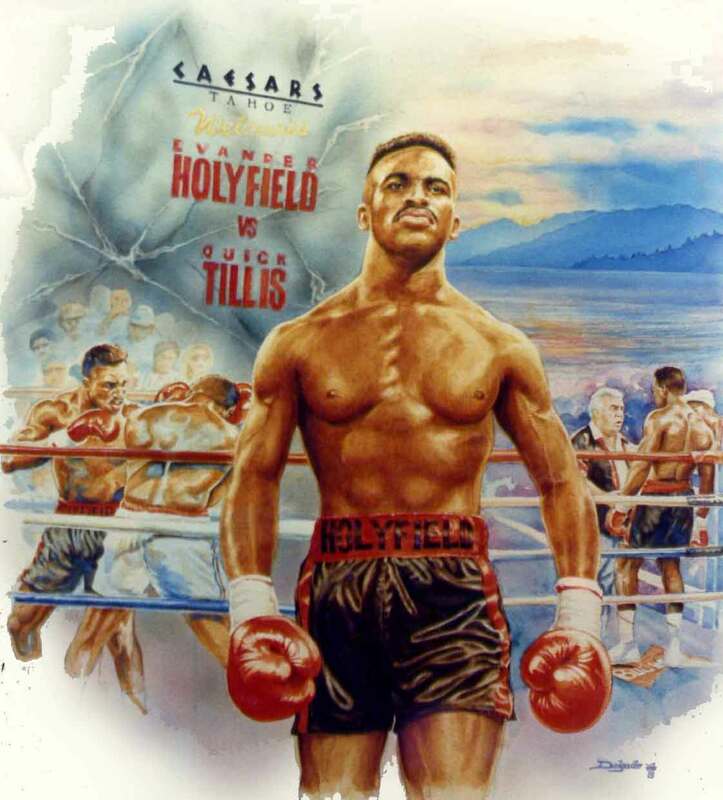 In this bout he devastated Tillis in the early rounds as he pursued boxing history against the beatiful backdrop of Lake Tahoe, NV. 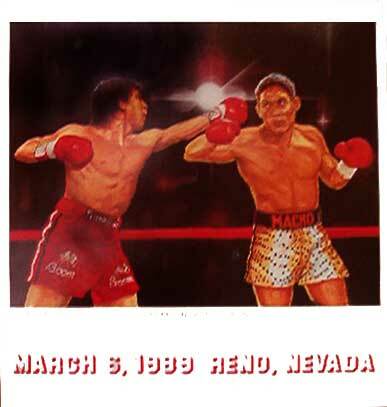 This official poster by Delgado features the Italian favorite, "Boom Boom" Mancini against tough Puerto Rican, Hector Camacho, "The Macho Man". 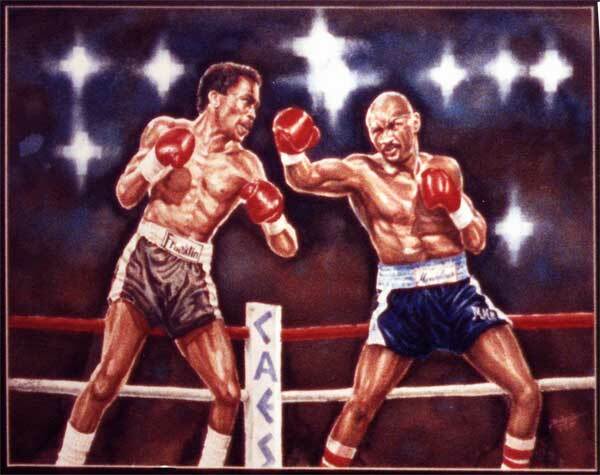 This nationally televised fight went the distance with the decision going to Hector. 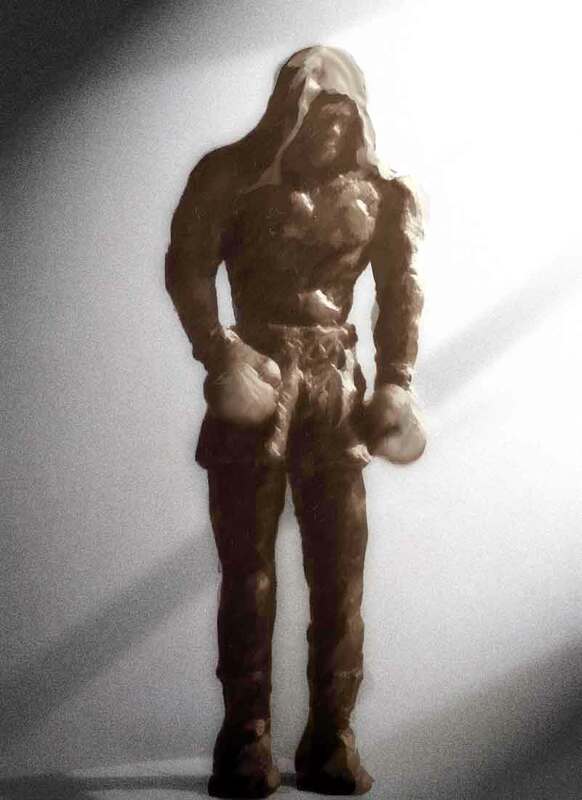 A bronze statue designed and sculpted by Delgado.